Imagine this: it’s the start of the Alaskan fishing season. You just finished up your first week on the water and it’s a good catch – salmon, halibut and cod are in abundance. The weather is in your favor and you have plenty of time remaining in the season to have an excellent year. Then, the worst happens – on your next run, your engine fails. It just couldn’t handle the daily requirements of a commercial fishing operation and you lose a cylinder kit, drop a valve or lose a turbo – each of which could leave you stuck on shore counting the days or weeks until you can get back on the water. In today’s competitive fishing market, downtime can be devastating. Without a reliable engine that can get your operation through the fishing season successfully and a service partner you can count on, you might as well be a fish out of water. When you depend on your seiner, gillnetter, trawler or fishing charter boat for your livelihood, the unbeatable reliability of Volvo Penta keeps your fishing operation going. Over 100 years of experience and innovation goes into the design of each engine, and every part is engineered and developed for high performance and durability. Volvo Penta engines provide greater uptime and longer service intervals – keeping you on the water for more days throughout the year. Their line of heavy-duty engines have proven successful in the harsh environment in which Alaska fishermen work: Volvo Penta is a trusted name in Bristol Bay, Kodiak, the Aleutian Islands, Ketchikan, Juneau, Sitka and Prince William Sound. Pacific Power Group has decades of experience powering and servicing commercial fishing boats in Alaska and throughout the Western U.S. We are the Alaska power center for Volvo Penta and work closely with dealers in Sitka, Kodiak, Petersburg, Homer, Juneau, Anchorage, Seward, Cordova, Naknek and Dillingham. Our team can inspect your current installation and provide a new Volvo Penta package that provides lower fuel consumption, greater performance and better reliability. Our attention to detail helps ensure that your boat is prepared to meet the rigorous demands of commercial fishing. We have a hands-on approach to ensuring your success. Our factory-certified service technicians understand the challenges facing Alaska fisherman and keep your engine running with minimal downtime. We work with our local dealers to provide rapid mobile and in-shop support 365 days per year, including emergency service. 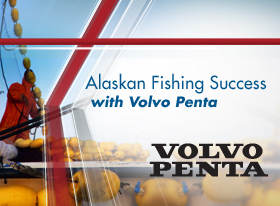 With Volvo Penta and Pacific Power Group, your boat is prepared for success on Alaska’s rich waters. Want more information about Volvo Penta? Click here for more information or contact our team with any questions you may have.